NEW YORK ( StreetAuthority) --Creating a list of high-yielding stocks is simple, but seasoned investors know that high yield alone is not a good reason to own a stock. That's because sometimes high-yield stocks report earnings that are too weak to sustain the current dividend. If your goal is to build a portfolio that's able to deliver steady income through good times and bad, then you'll need to find high-yielding stocks with solid fundamentals, good earnings growth and a more conservative payout. Companies with modest payouts have a higher safety margin and the ability to increase the dividend to maintain the payout during bad times, or even raise the payout during good times. This makes these stocks especially appealing. In fact, studies show high-yield stocks that also have low payout ratios deliver the best long-term returns. With this in mind, I created a list of high-yield stocks with room to boost future payouts. I ran a screen for stocks yielding more than 3% while paying out less than 40% of earnings and at least five years of positive earnings growth. Here are three high-yield champions that could easily afford to raise dividends. 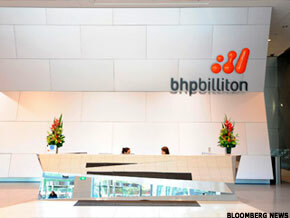 BHP Billiton is the world's top producer of major commodities such as aluminum, coal, copper, manganese, iron ore, uranium, nickel, silver and titanium minerals. These are all natural resources that have become increasingly scarce, so BHP is ideally positioned to benefit as rising demand pushes up prices. BHP is quickly expanding. It plans to spend $80 billion in the next five years to boost output of iron ore, copper and coal. Last year, it acquired U.S. shale assets, making the company the world's 10th largest independent oil and gas producer as well. The company also has a major advantage in that most of its major assets are located in low-risk regions such as Australia, Canada and Europe. BHP also has a strong balance sheet and exceptional annual cash flow -- $30 billion -- which exceeds total debt of $25 billion. This has earned BHP a debt rating of "A+" from ratings agency Standard & Poor's. In the past five years, BHP has delivered 15% yearly earnings growth and a 37% average return on equity (ROE). Dividends have risen more than 30% a year, and with a payout at just 26% of earnings, there's plenty of room for further growth. CA Technologies is the world's leading vendor of software for information technology management. More than 99% of Fortune 1000 companies use CA software for IT tasks such as managing databases, backing up data and running compliance checks. CA benefits from demand for evolving IT technologies such as virtualization, cloud computing and software-as-a-service. In addition, the company invests $600 million a year in research and development and as much as $500 million a year in technology acquisitions. CA's earnings rose 11% in 2011 and an average of at least 9% in each of the past five years. The company generates more than $1.3 billion of annual cash flow and is returning more cash to investors. With payout at just 11%, CA was able to hike its dividend five-fold in the first quarter of 2012 to a new annualized rate of $1. CA has a very healthy balance sheet showing $2.5 billion of cash and only $1.4 billion of debt. The new 4% yield puts CA in the top-tier of dividend-paying technology companies. There is still room for growth because the new payout is still only about 40% of projected 2012 earnings. With proven reserves of 14.3 billion barrels, Shell ranks as the world's fourth-largest oil company. The company produced 1.2 billion barrels of oil last year and replaced 160% of reserves, meaning the company discovered 16 new barrels for every 10 barrels it produced. Shell is divesting noncore assets and reinvesting the proceeds in exploration and production. The company has a huge oil sands project underway in western Canada that is expected to raise overall oil and gas production by as much as 10%. Shell also has a large shale gas position in North America that is projected to add to the bottom line. Its deep-water drilling operations in the Gulf of Mexico also hold considerable promise. These projects should result in cash flow 30% to 50% higher in the next three years compared with the previous three years. Since listing American depositary receipts (ADRs) on the New York Stock Exchange seven years ago, Shell's earnings have grown more than 75%. The company produces $37 billion a year of cash flow and has an exceptional balance sheet, showing $11 billion of cash and debt at only 16% of capital. With payout at only 30% of earnings, Shell's dividend looks very secure. Shares offer a rich 4.9% yield. While Shell hasn't increased the dividend in three years, a modest increase is planned in 2012. Risks to consider: BHP shares have a high 1.5 beta, which means the stock is roughly 50% more volatile than the overall market. CA faces increasing competition from tech giants IBM ( IBM and Hewlett-Packard ( HPQ, as well as earnings challenges because of the eurozone crisis. The Dutch government takes a 15% withholding tax on Shell dividends, though U.S. investors can reclaim that from the Internal Revenue Service as a tax credit. Action to take: All three of these stocks carry high yields, yet each of these companies could easily afford to raise dividends. My top pick overall is BHP because of its control over scarce assets and the diversity of its revenue sources, which reduces risk. CA is attractive based on a growing dividend and unusually high yield for a technology stock. Shell should appeal to investors who want a rich dividend and a pure energy play. >>To see these stocks in action, visit the 3 High-Yield Stocks That Could Easily Boost Dividends portfolio on Stockpickr. Lisa Springer does not personally hold positions in any securities mentioned in this article. StreetAuthority LLC owns shares of BBL in one or more if its "real money" portfolios.